Growing up in the south, I learned at a very early age that women didnt leave their home without at least one accessory. An accessory is something nonessential but useful. Of course we know that door knobs are an essential part of our home but have you ever given thought to dressing yours up. After I painted my kitchen cabinets it was essential that I replaced those out dated ones with these. For just a few dollars you can change so much. I know they can get $$ so I went to Lowes and bought these in a value package. Saved plenty! Try different shapes in a bathroom. This is my hall bath so I was able to spend a little more only needing two. When we built the house I had the brass knobs. Just by changing the doorknobs we took years off of our home. We stayed with the same finish as our cabinet knobs. You dont have to stop at doors. Try giving that small piece of furniture a punch! 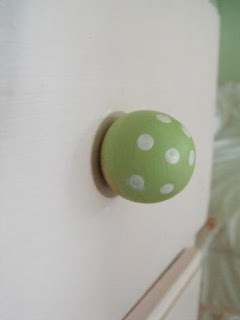 I bought small wooden knobs and painted them to match her room. If you look close you can see where I missed a few spots,yikes. It doesn't matter though because Madison is fixing to get a whole new room makeover..Darn tootin! This is my desk that I rescued from the dumpster. 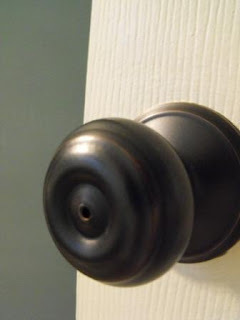 A coat of black and this sweet knob. Go big and make a statement if you dare! I found this one at the Hobby Lobby and love it. So go forth and dress your nest to it's best. Your doors will thank you! I ♥ knobs!! I just redid my TV hutch and put glass knobs on it. I think it looks so much more "grown up", yes I said the same thing on my blog but for some reason it just feels more adult. How can an old door and glass knobs do that to an item?????? Ahhhhh I love knobs. 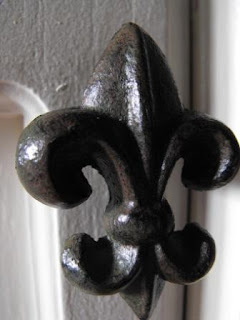 I love the fleur de lis! How cute. You're right, knobs make all the difference. Um, what's up with your banner though? It's HUGE and gets cut off because of its HUGENESS. How creative you are!!! I love all of them. Makes me want to stir things up a bit 'round here!! Oh be still my heart! That black and white knob is incredible!! I need knobs like that on my desk. I completely agree that the hardware you choose can take years off a home. Thanks for sharing yours, as usual it is beautiful! I just finished a job for a client changing out all the dated hardware in her house...light fixtures, faucets & knobs, what a difference! What a fantastic post!!! These are the things that less creative people don't think about! Thanks for the inspiration! They are some great knobs. I love the black & white one. I have to agree Susie. 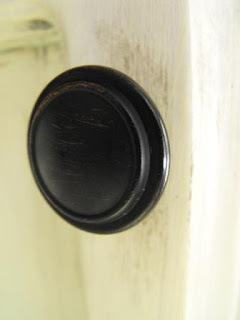 I grew up in a 150 year old house with the glass door knobs. I still remember gazing at them as if they were diamonds. One of my only regrets is not changing them out and taking them with me when my parents moved! I could kick myself for not thinking of that. Great post. This is something that definitely needs to be done in our kitchen. Thanks! love it! 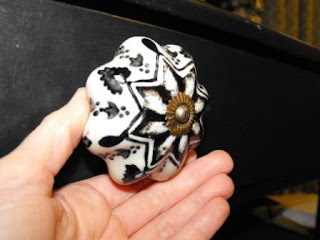 i saw some super fab knobs at anthropology the other day! Those knobs are fabulous - I'm a sucker for the oil rubbed bronze. I have my builder knobs that came with our home on craigslist right now - no one is biting! Hope to sell them soon and get something I really want. Love your new knobs!! I have some black ones for my armoire that I got from Hobby Lobby. Looks so much better!! 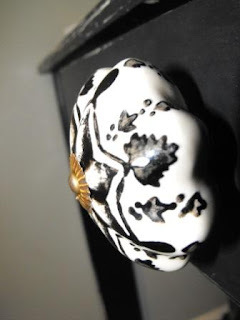 I'm in love with the crystal and fleur di lis knobs! 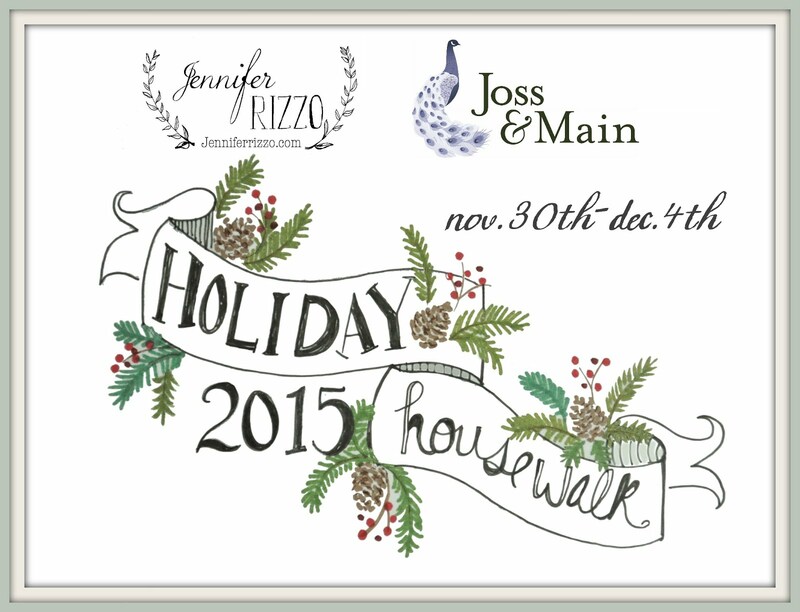 I'd love to change the hardware on my front door and think that may be the next project! I love all your knobs...I have been searching for some great knobs and pulls for my kitchen ( and need quite a few...) I found some awsome pulls and knobs at Hobby Lobby for my MB redo, but still am having no luck with the kitchen...even at Lowes, Home Depot, Menards....does anyone have any good online sources? What a fun post! I just love knobs...and you're right...they are such an easy way to update! 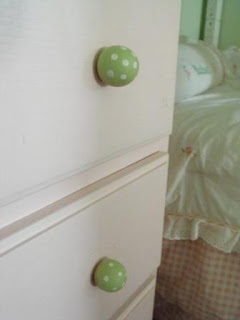 You are right...knobs can make or break a piece of furniture. Take it from blah to AHHHH !! It is such a simple, but effective update! Darlin' knobs! Especially the last one--black and white. 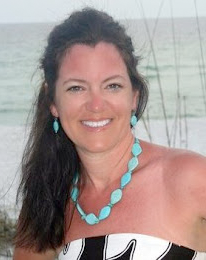 Suzie, make sure to please, please, please visit my blog today! I'm calling it "Decorating Dilemmas!" I hope that you can help!! So cute! and so beautiful! I love it. Thanks for sharing your inspiring picutes. Darling! I've intended to collect knobs to make a coat hanger with, but I can't find ones I like around here. Thanks for the inspiration to keep looking! Will u please move to NJ & be my personal decorator? Puh-leeze? Such a small item makes such a big difference. I love your knobs! 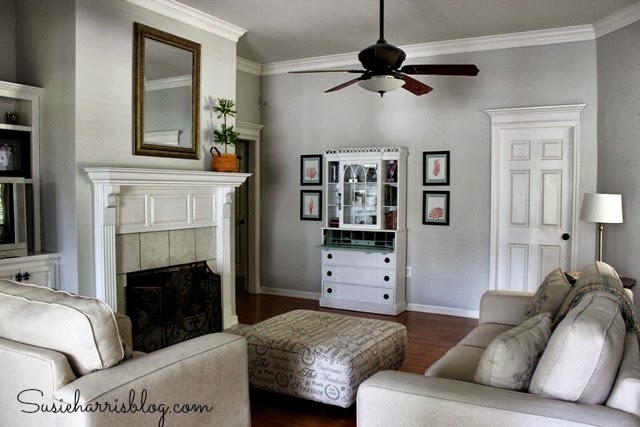 I agree with you that knobs really add a wonderful touch to furniture or cabinets! Yours are beautiful. 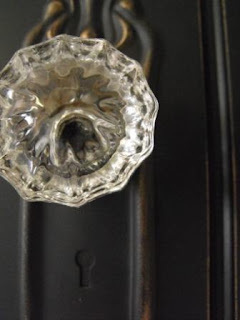 I love glass knobs! those are great..it's amazing how the little touches mean so much. 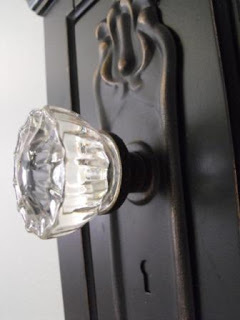 Ooooh, I wish I had the old fashioned glass doorknobs! Love the fleurs de lis too. You can get a great deal on new cabinet hardware on ebay...we spent about $40 for our whole kitchen. 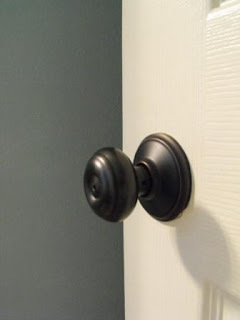 My cabinets in the bathroom need a major knob redo! Beautiful post, Susie. 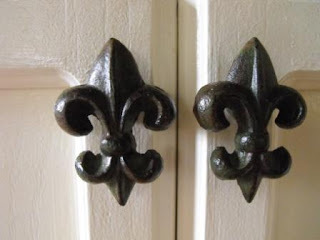 I love those fleur de lis knobs. I hate to say anything to J, but I'm sort of longing for a little different knob for the island, since it's been painted. I love them all, especially the fleur de lis!! What a difference all those knobs make! 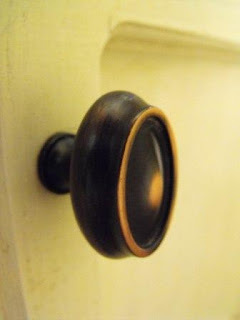 I love looking at the knob aisle in Hob Lob and trying to find a reason to buy them. :) Yours look great!! I love knobs too -- maybe a little too much. I've started a collection of MacKenzie-Childs' that maybe someday I'll attach to something. They sure are fun to look at. They all look fantastic! Love them all!!! New knobs alone made a huge difference in the overall look and feel of our kitchen. The first thing we did after we moved in was get rid of those round brass ones! New knobs do make a difference. 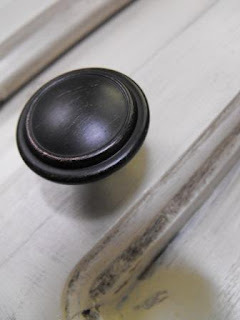 We changed all of our brass door knobs to brushed nickel...Big difference! 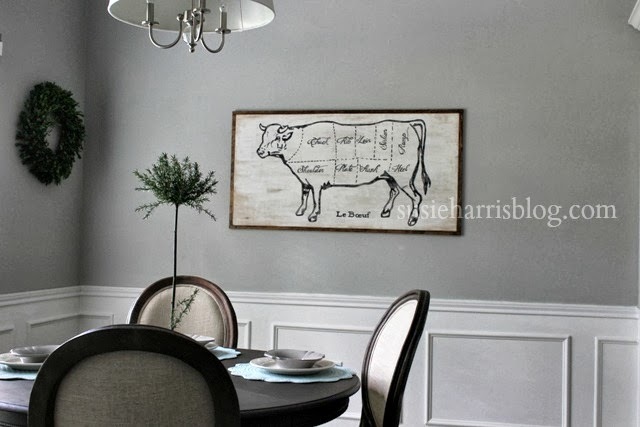 Very good ideas to update furniture. You are very creative and I am looking forward to learning more from you! So pretty, I love the fleur de lis ones the best! 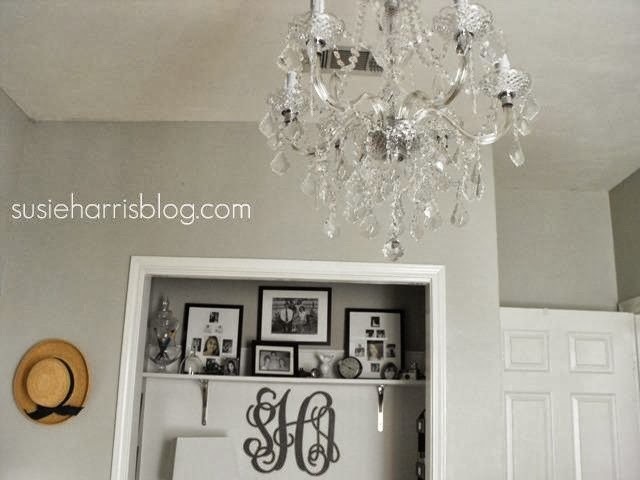 I want those fleur de lis knobs! I want to change all the hardware in my kitchen to an antiquey looking black, something like yours. I will also have to either change or paint all the hinges too so I'm not sure when I'll get to it. Love all the pretty "jewelry" you showed! All of your knobs are great. I especially like the black & white one that is on your desk. Ok, I am ready start replacing some of my knobs now! !